The retrieval of personal mastery experiences has been linked to adaptive functions, such as increased perceived self-efficacy and coping capability. Successful exposure leads to an increased mastery experience with respect to anxiety provoking situations, possibly due to a violation of expected negative outcomes. We investigated whether the reactivation and evaluation of mastery experiences after a brief virtual reality exposure (VRE) training can enhance self-efficacy and promote exposure therapy benefit in patients with acrophobia. Acrophobic participants (N = 56) were randomly assigned to a memory reactivation and evaluation (= VRE–MRE) intervention, a control (= memory reactivation; VRE–MR), or no intervention (= VRE) after VRE. The VRE–MRE condition involved the evaluation of mastery experiences associated with exposure and related events from the past. The effects of the VRE–MRE intervention were assessed on the level of behavioral avoidance and subjective fear at post-treatment and one-month follow-up. 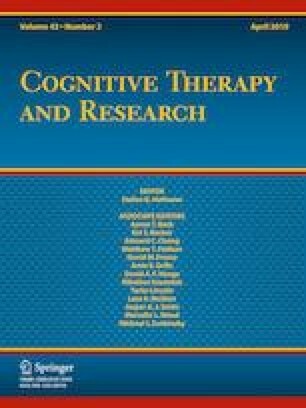 Relative to both the VRE–MR and VRE conditions, the VRE–MRE group showed an increase in self-efficacy and exhibited more pronounced reductions in behavioral avoidance, subjective fear at the initial approach distance, as well as scores on the acrophobia questionnaire (AQ) from pre- to post-treatment. The superior effects of the VRE–MRE intervention remained evident on the level of behavioral avoidance and associated subjective fear at the initial approach distance, but not on the AQ, from pre-treatment to follow-up. These findings indicate that the reactivation and evaluation of mastery experiences could be used as a strategy to increase exposure-based therapy in anxiety disorders. The online version of this article ( https://doi.org/10.1007/s10608-019-10018-x) contains supplementary material, which is available to authorized users. This study was funded by Deutsche Forschungsgemeinschaft (DFG, German Research Foundation) - Projektnummer 316803389 - SFB1280 (Project A13 awarded to A.Z. and J.M). The funders had no role in study design, data collection, manuscript preparation and decision to publish. Friederike Raeder, Marcella L. Woud, Silvia Schneider, Christina Totzeck, Dirk Adolph, Jürgen Margraf, and Armin Zlomuzica declare that they have no conflict of interest.